The seven separate regular polygons of the inner Tree of Life have 48 sectors, where 48 is the number value of Kokab, the Mundane Chakra of Hod. The first three polygons have 12 sectors, the next three polygons have 24 sectors and the last polygon (dodecagon) has 12 sectors. 12 red hexagonal yods at centres of tetractyses ↔ 12 red hexagonal yods at centres of sectors in the dodecagon. 24 red hexagonal yods at centres of tetractyses ↔ 24 red hexagonal yods on sides of the dodecagon. 24 red hexagonal yods at centres of tetractyses ↔ 24 red hexagonal yods on internal sides of tetractyses in the dodecagon. 60 red hexagonal yods at centres of tetractyses ↔ 60 red hexagonal yods in the dodecagon. 60 red hexagonal yods at centres of tetractyses ↔ 60 red hexagonal yods in the dodecagon of the mirror-image set. As the fourth Platonic solid, the icosahedron represents the completion of the archetypal sequence of generation of the regular polyhedra, starting with the tetrahedron. 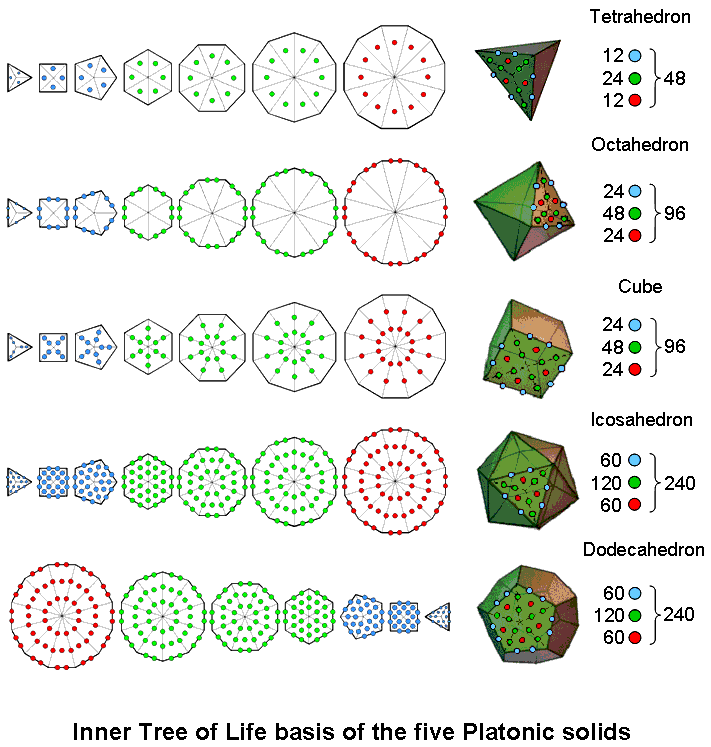 Not only does it have the same number of hexagonal yods as the seven separate polygons of the inner Tree of Life do but also the 60:120:60 pattern of their spatial distribution is the same as that shown by the 3:3:1 pattern of polygons constituting each half of the inner Tree of Life. Its dual — the dodecahedron — contains the same number of hexagonal yods as there are in the second set of seven polygons in the mirror-image half of the inner Tree of Life. The duality of these two regular polyhedra is the three-dimensional counterpart of mirror reflection of the seven polygons. The five Platonic solids are sacred because they are the regular polyhedral counterpart of the sacred geometry of the inner Tree of Life. As many other pages in this website point out, the scientific meaning of the 240:240 division of hexagonal yods between either the first three Platonic solids and the fourth one or between the fourth and fifth ones is that they embody the (240+240) roots of E8×E8, one of the two Lie groups that were discovered in 1984 by physicists Michael Green and Gary Schwarz to govern superstring interactions that are free of quantum anomalies. The embodiment is discussed here and here.